Departure in the morning from the pier with our driver for your unforgettable excursion of these five exquisite seaside Italian villages: the so called Cinque (five) Terre. 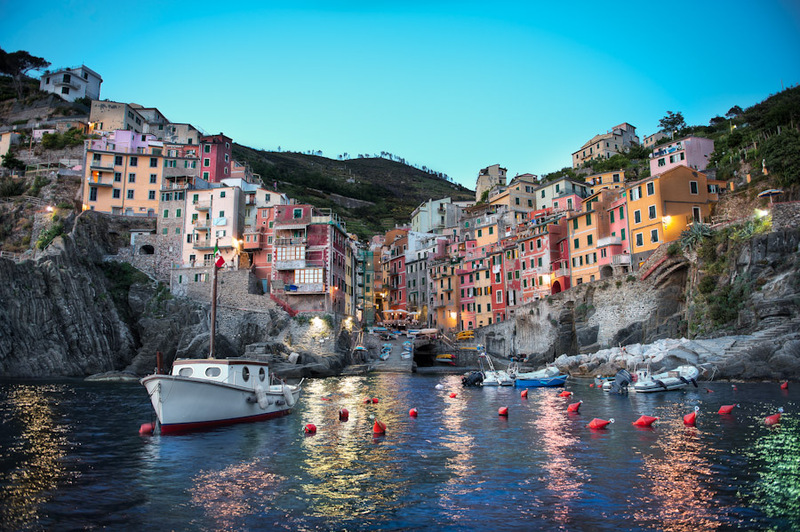 Admire some of the most beautiful coastal landscapes of Italy as you make your way through Cinque Terre. Your tour will begin with a drive to Riomaggiore, the first of the five towns. Here you will have time to independently explore the village and its charming streets and pastel houses. Your driver will walk with you to the centre of the small village and give you maps and suggestions for spend a lovely day on your own.. You will have the option of walking to the next town via the famous “Way of Love,” or you may choose to travel by train or by boat – (remind that these are the only options to travel between the Cinque Terre national park as cars are banned from all villages!) – Once you arrive in Manarola, you may freely explore the town. Be sure to venture to the top of Mararola where you will see the church whose bell-tower once served as a lookout for potential pirates. Continue the visit of the remaining towns…Perched high above the sea and surrounded by vineyards, Corniglia is considered to be the quiet town of Cinque Terre. Enjoy the relaxing atmosphere and stunning views of the sea before you visit Vernazza. Explore the delightful streets and enjoy the views of the beautiful natural harbour. Your final stop will be Monterosso, a town divided into old and new sections. Be sure to visit the 16th century lookout tower in the old section. From the beach in Monterosso you can see a beautiful view of all five towns that make up Cinque Terre. After a wonderful day of sightseeing, your driver will meet you in Monterosso and transport you back to the port of Livorno in about 1 hour and half drive. If you want to hike remind to have comfortable shoes! Is also possible to have a private boat tour from 2 up to 4 hours. Ask for more informations to our booking office.